Detached double bespoke oak garage. South West facing garden and kitchen/ living/dining space. 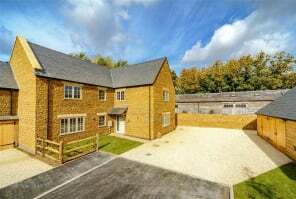 With stunning countrywide views. 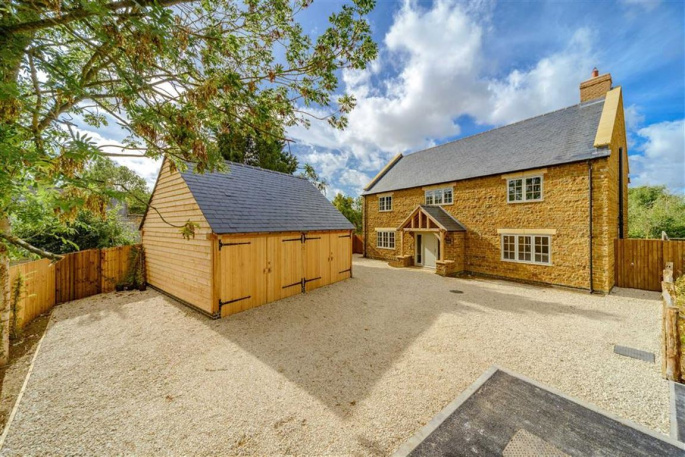 Hay Barn House is the largest home in Manor Farm Court, set in generous private gardens and benefitting from a large detached two bay oak Garage. 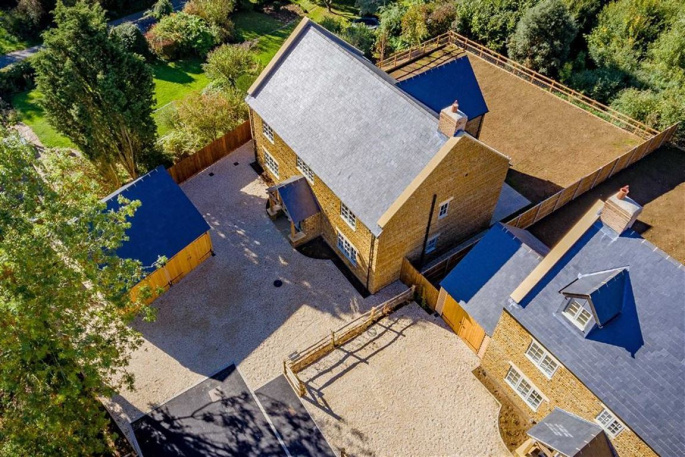 An Impressive five bedroom detached family home offering modern living accommodation. 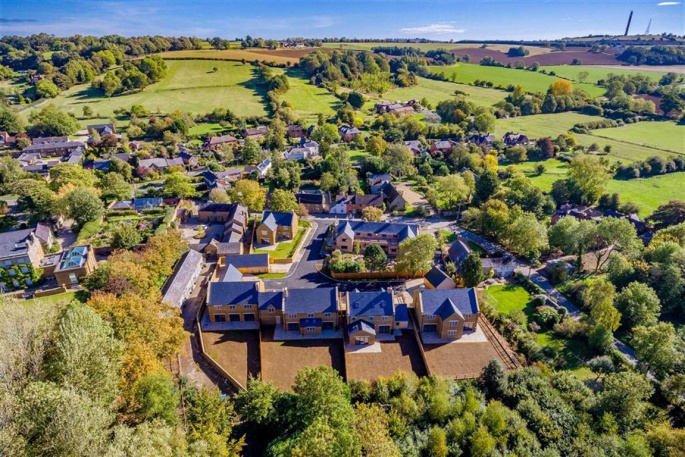 Is the largest home in Manor Farm Court, set in generous private gardens and benefitting from a large detached two bay oak garage. An impressive five bedroom detached family home offering modern living accommodation over two floors. 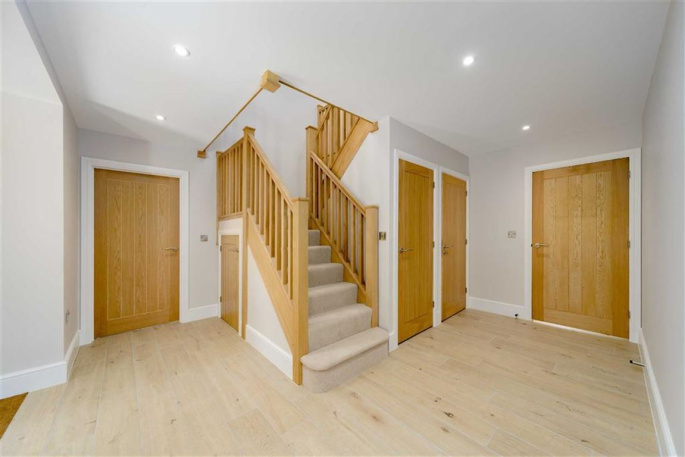 An oak entrance porch leads to the spacious reception hall featuring a grand bespoke oak staircase. 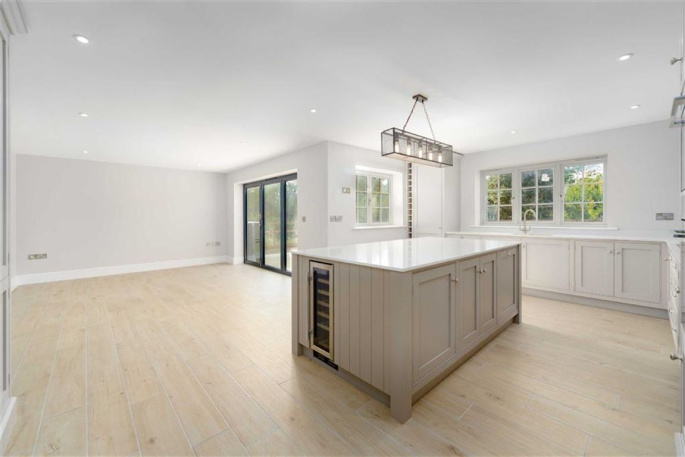 Leading through to the generously proportioned kitchen/dining/living area with bi-fold doors out onto the terrace, private gardens and the countryside beyond. 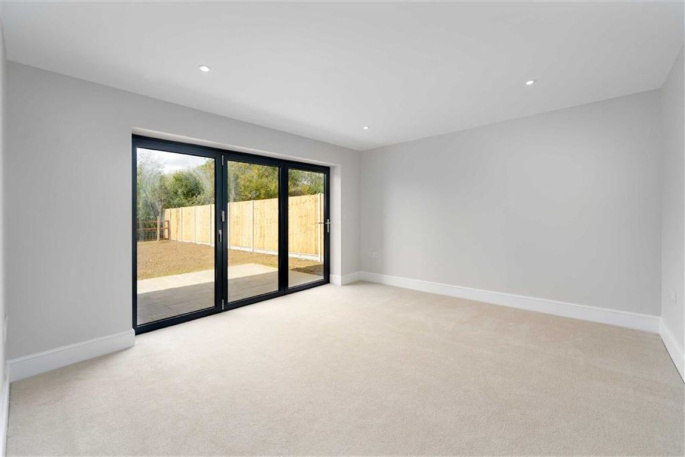 The ground floor accommodation also boasts a bright family room with bi-fold doors to the gardens, a welcoming lounge, a study, WC and separate utility. 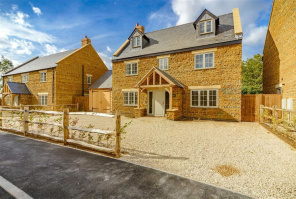 The well-planned bedroom accommodation on the first floor comprises a master suite with bedroom, en-suite and walk-in wardrobe with four further bedrooms and a superb family bathroom. 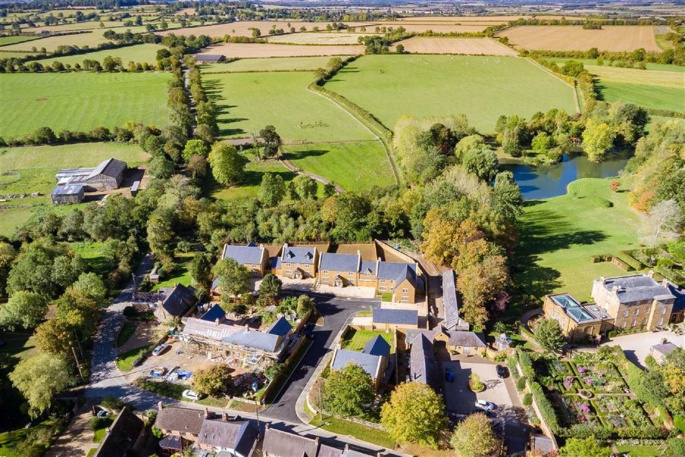 Externally, the extensive terrace and lawned gardens are secured with close panelled fencing and pet proof post and rail fencing. * Each home has a unique kitchen. * The kitchen has been individually handmade with superior craftsmanship by Swan Bespoke Furniture. * Cabinets of solid wood, designed with a classic but contemporary feel. * Draw boxes made of solid oak, with soft close mechanism. * Integrated handmade wine rack and wine cooler, oversized cutlery draw pack unit, glazed wall cabinets with warm white LED lighting are some of the kitchen's features. * High quality stainless steel and satin chrome door furniture. 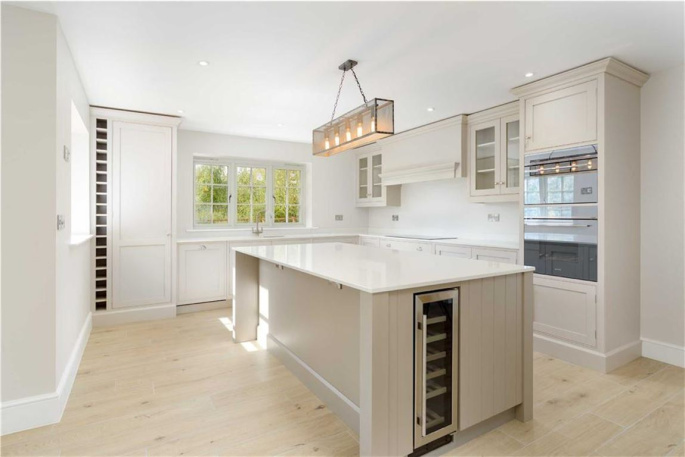 * Kitchen units are paint finished using Farrow & Ball and Little Greene paint company. * Worktop is angelo white silkstone quartz. * Integrated appliances are supplied by Smeg. Dishwasher, double or single fridge freezer units, multifunctional touch control ovens, five zone touch control induction hob, cooker surround, canopy hood with mantle for extractor fan and integrated bin cabinet. Sink units being 1 ½ bowl sink and tap set. 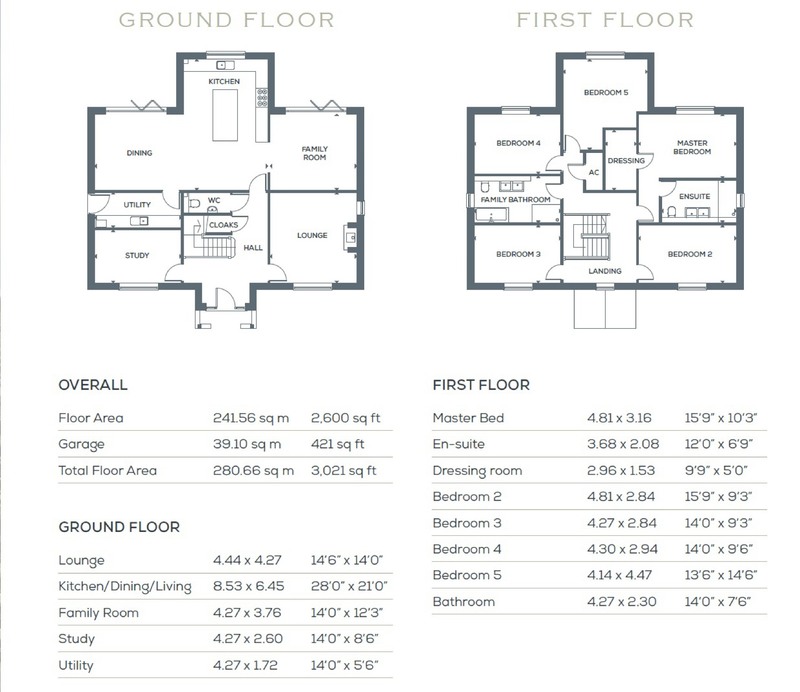 * The kitchen has a large island unit to create a unique family entertaining area. 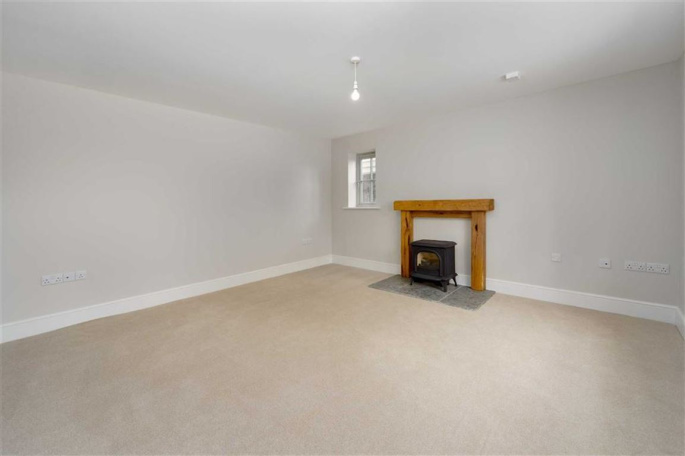 * The utility room is handmade and in keeping with the kitchen, providing ample space for storage cupboards, shelving, worktop, 1 ½ sink and bowl, washing machine and dryer spacing. * Contemporary white ceramic sanitaryware by Royo Onix. * Contemporary porcelain wall and floor tiles. * Chrome heated towel rail. * Low profile shower tray with clear glass screen. 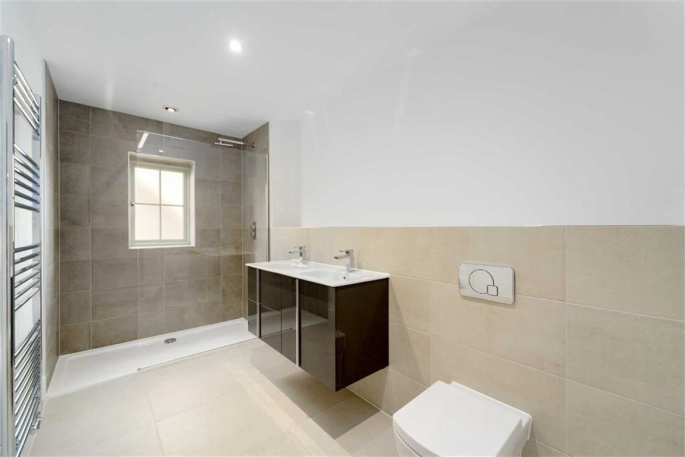 * Large double sink and single sink gloss grey vanity units throughout. * CAT 6 cabling installed throughout. * Multimedia installation to provide, terrestrial TV, satellite TV, telephone/internet data points. * WiFi sound system capabilities throughout. * Brushed chrome door furniture throughout. 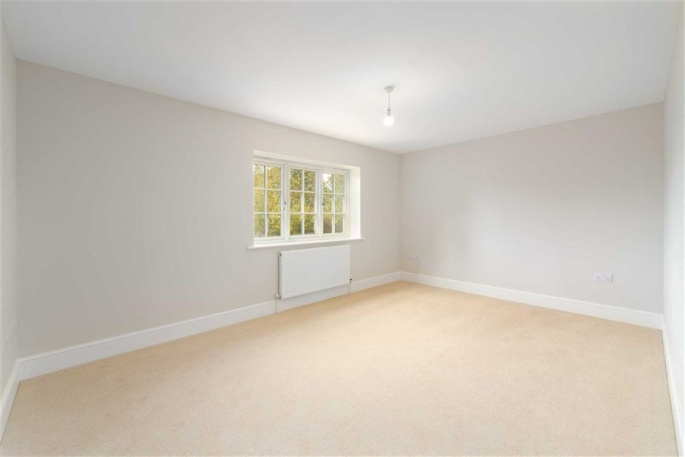 * Neutral luxelle carpet and underlay to all bedrooms, stairs and reception rooms. * Wood effect tiling through entrance hall, WC, cupboards, kitchen and utility. * Decorated throughout in a neutral colour palette using Skimming Stone (colour) emulsion paint for walls and ceilings. * Elegant skirting and architraves featured throughout finished in satin white. 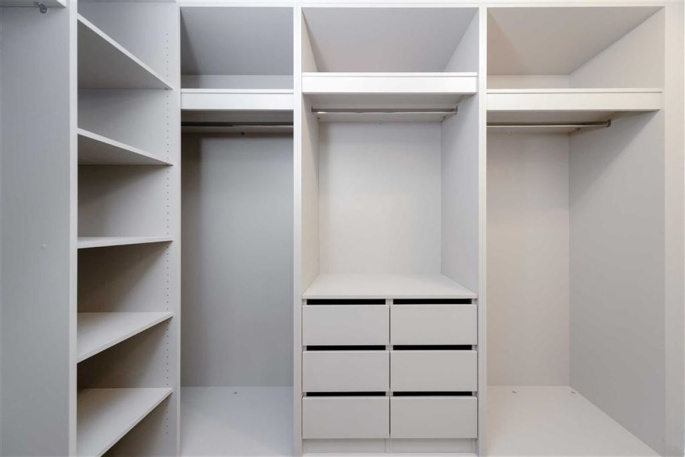 * Bespoke designed dressing room in the master suite with chrome furniture, finished in cashmere colour. * Exposed finished hearth fireplace with gas log burner. * Task lighting beneath kitchen units. * A combination of mains LED lighting throughout. * Multiple TV sockets to each bedroom. * Off white electrical sockets and light switches throughout. * External lighting featured for the property, porch light, front of house lighting, lighting to pathways, utility door light, external rear lighting in all entertainment areas, sensor spot light to garage. * Drive way dusk till dawn bollard lighting to drives and street lighting. * Worcester Bosch gas boiler and water cylinder for heating and hot water system. 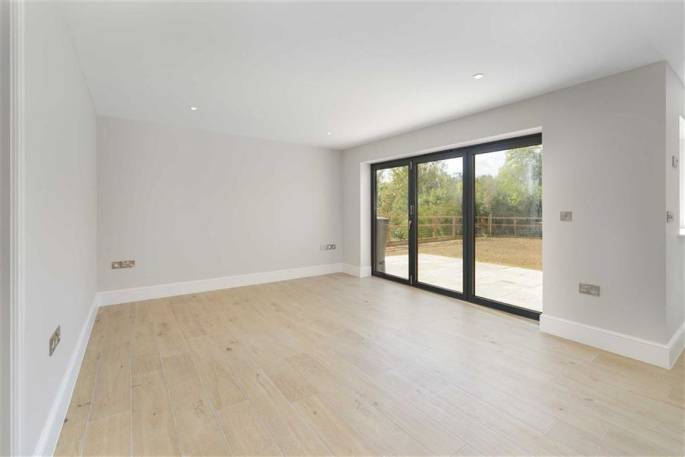 * Thermostatically controlled zonal underfloor heating throughout the ground floor. * Radiators to first floor. 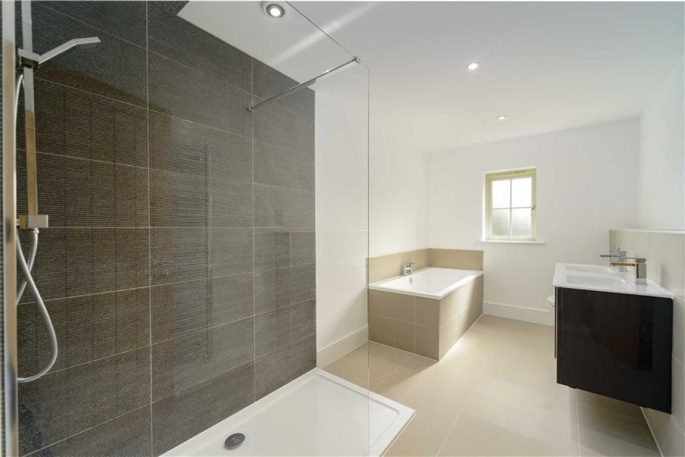 * Thermostatically controlled underfloor heating to family bathroom and master en-suite. * Chrome thermostatically controlled heated towel rail to bathroom and master en-suite. * Mains supply smoke/heat detectors with battery back up. * Hardwired for alarm system. * 10 year CRL build warranty. 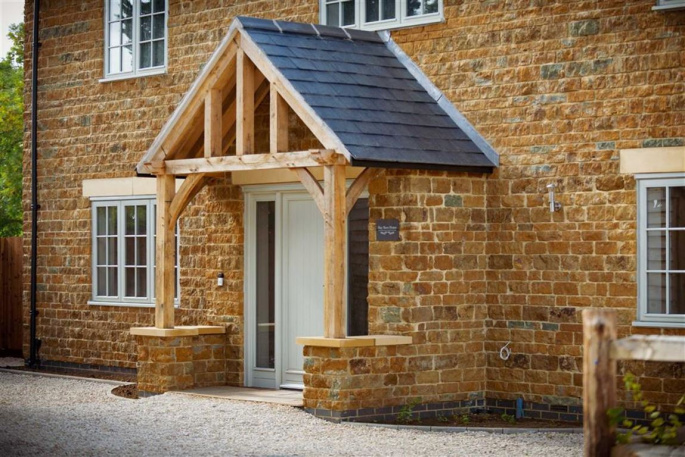 * All external windows are bespoke flush timber casements, finished in pebble grey. * Aluminium bi-fold doors are finished anthracite grey. 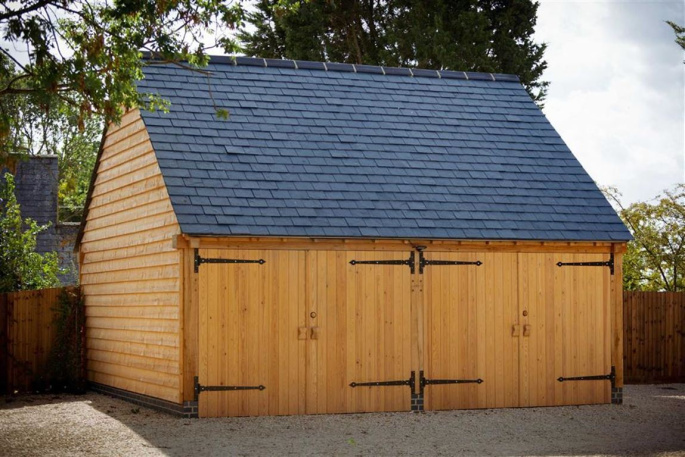 * Double bespoke oak garages. * Electrical and water connections to the garage. 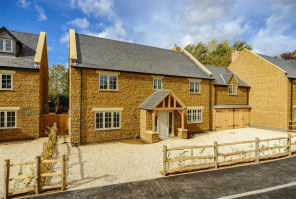 * Landscaped throughout with, close panelled fencing and post and rail fencing. * Ducklington gravel drive way. * Large patio area for entertaining in soft sand slabs. * Pathways to utility rooms. * Water and sewage connections to main utilities.